Are you one of the people who want to convert VOB to HEVC/H.265 for enjoying HD video on computer, iOS devices or latest Android devices? As is known to all, VOB (Video Object) is the container format in DVD-Video media and usually it is used to store digital video, digital audio, subtitles, DVD menus and navigation contents. Stored in the VIDEO_TS directory at the root of a DVD, files in VOB format commonly are encoded with H.262/MPEG-2 Part 2 or MPEG-1 Part 2 (video codecs) and MPEG-1 Audio Layer II or MPEG-2 Audio Layer II (audio codecs). Though there are all sorts of media players supports replaying VOB files including MPlayer, VLC media player, GOM player, Media Player Classic, etc., VOB video format still isn't compatible with Mac, QuickTime, iPhone, iPad or Android devices. Actually, people would like to transcode VOB to HEVC for playing on HEVC-capable devices like iOS 11 iPhone iPad, macOS High Sierra MacBook iMac, Win 10 computer or Android device. The main reason is that HEVC/H.265 video codec has higher data compression ratio, superior video quality and better compatibility. Besides, according to test data, HEVC can bandwidth consumption by 70-80% for the same content comparing with H.262/MPEG-2. This is also why so many people wanna convert VOB to H.265/HEVC no matter for playback with ease or sharing with others. * transcode any codec to HEVC/H.265 with smaller file size and original quality reserved, for example, convert H.262/MPEG-2 to H.265, H.264 to H.265, VP9 to H.265, Divx to H.265, X265 to X264, etc. * convert VOB to HEVC/H.265 MP4, 4K MP4, 2K MP4, MKV, MOV, M4V, AVCHD, M2TS, AVI, WMV and various video formats for playing on the latest HEVC-capable devices like iPhone X/8/7/6S/6 (Plus), iPad Pro/Air 2, Samsung Galaxy Note 8, Huawei, etc. * decode VOB video and re-encode to HEVC/H.265, MP4, AVI, MOV, etc at 5X faster speed than before thanks to its multi-core CPU (up to 8), hyper-threading, and Intel Quick Sync Video hardware acceleration techs. * upscale 360P/720P/1080P VOB video to 4K 2160P HEVC video. * download online HD/4K/8K videos free from YouTube, Vevo, Vimeo, FaceBook, Dailymotion and other 300+ online sites. Please download this VOB to HEVC converter on your Mac computer; you should download Windows version if necessary. Then, fire up it to prepare for VOB to H.265/HEVC conversion. Step 1: Hit "+ Video" button to add VOB file you desire to convert. Or just drag and drop .vob files to the main interface of this VOB to H.265 video converter. Certainly, you can input several video files at a time. Step 3: Specify the destination folder to save the converted VOB file and hit "RUN" button to start to convert VOB to HEVC/H.265, VOB to MP4, VOB to QuickTime, VOB to iTunes, etc. on Mac/Win. BTW, the conversion speed largely depends on your computer configuration. To improve the conversion speed, you can find "CPU Core Use" option on the top this VOB converter to set how many cores you wanna use to transcode VOB to HEVC. Or you can tap icon to reduce resolution from 4K to 1080p/720p. 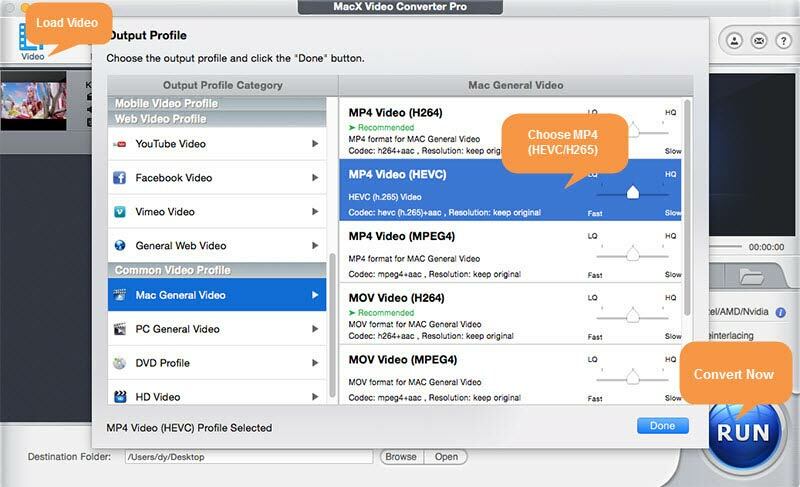 Free download best VOB to HEVC/H.265 converter - MacX Video Converter Pro to easily and fast convert VOB to HEVC/H.265, mp4, avi, mov, mkv, h264 etc for iPhone, iPad, Android. It will also free download HD/4K videos from YouTube, FaceBook, Vimeo, and 300 more sites with fast speed.